Those of you that know me, understand I can’t resist a good laugh. And boy do I belt them out when the spirit moves me. The other day the spirit moved me with just a few words from my son, but first a little background. The winters up here in the north western UP of Michigan are long and cold. We all know and understand this, and have become pretty good at getting by in all the ways you must; physically, mentally, psychologically, etc. We resist the inconvenience of the whole thing, and do our best to enjoy the advantages the season has to offer. But there are limits. We recognize the “cabin fever” syndrome, where we become cranky for no reason, and grab any excuse to jump in the car and go somewhere, do something, just get the blood moving for a bit. In my opinion, any relationship that weathers a long cold winter is capable of weathering anything. I happened to be at the house my son is renting in Hancock (about 20 miles from here) the other day, and was helping him with something or the other. As we were walking from the car to the house, he looked over at the garage, and said, “Oops, it looks like the mailbox is gone again.” And that is what started me on a good minute of belly laughs. During the non-snow time of the year, the mailbox, which is attached to the side of the garage, is a comfortable height for the mailman to insert the letters. 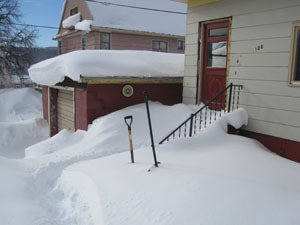 Over the course of this relentlessly snowy winter, several steps of his porch have disappeared beneath the snow. And if he doesn’t keep after it, the snow completely covers his mailbox, making it important for him to shovel it out so the mailman can crouch down and deliver his mail. At this point of the winter, which I was privileged to share with him, he decided that it was just too much effort to keep the mailbox open, when compared to the advantages of getting his mail. I remember listening to myself laughing at his comment, and am pretty sure there was no hysteria present, but you can’t be sure when you are observing yourself. So keep an eye on me if you don’t mind, and if you see the telltale signs of acute cabin fever, book me a flight to Cancun. This entry was posted on Friday, February 21st, 2014 at 6:10 pm and is filed under Uncategorized. You can follow any responses to this entry through the RSS 2.0 feed. You can leave a response, or trackback from your own site. How about a flight to Ironic Mountain? You have THE best laugh of anyone anywhere of all time and it still makes me feel so joyful hearing it in my head many years since I have in person! I enjoy letting out big belly laughs myself, often happens while I’m teaching.